Many organizations run multiple disparate job schedulers. They may be homegrown, tied to an operating system or platform, or standalone, but they usually sit in silos and rarely talk to each other - resulting in a costly, inefficient environment. There is a better way: enterprise workload automation. With a single, integrated point of control, IT can lower costs, improve compliance, and be more agile. 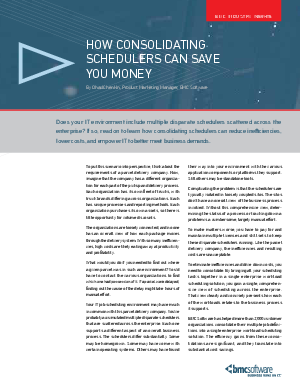 Most importantly, consolidating schedulers onto a workload automation solution leads to better service delivery, improving IT's ability to support the business.